The electoral success of Islamic parties in Egypt, Tunisia and Morocco, has raised worries about policy and legislation on family and gender issues, this despite re-assuring noises from leading figures. The electoral success of Islamic parties in Egypt, Tunisia and Morocco, has raised worries about policy and legislation on family and gender issues, this despite re-assuring noises from leading figures. Earlier electoral successes of Islamists in Iraq had brought about a disorderly mix of family policies and rule of disparate religious authorities, accompanied by much constraint and intimidation. This may be a good time to reflect on the record of various Middle Eastern countries on these issues over the course of the twentieth and twenty-first century and their relations to political regimes. In the early and middle decades of the twentieth century it was always dictators who embarked on policy and legislation which liberated and empowered women in both family and society. Ataturk started the process in Turkey, followed by Reza Shah in Iran, a model followed less boldly by some Arab leaders in later decades. And they did so against strong popular opposition, religious, conservative and patriarchal. It is unlikely that such reforms would have passed electoral ‘democratic’ processes. In societies based on communal, kinship and patronage allegiances ‘democracy’ is never liberalism. Are we witnessing the effects of this principle in present day situations? Agitation/revolution initiated by movements for liberty and social justice by the urban young usher in elections, in which the vast hinterlands of populations to whom these concepts are alien or secondary then vote for patriarchal and conservative forces. It is never too often repeated that Tahrir Square is not Egypt. Flickr/Al Jazeera English. Some rights reserved. What were the institutional forms of the reforms of the twentieth century? The reforms were pursued in two spheres: family and wider society. These two did not always go together: in Egypt for instance, from the middle decades of the twentieth century, while women could participate at most levels of the labour market, in politics and public life, they still suffered subordinate and disadvantaged positions within the family, as provided by personal status laws. It was those latter spheres of law which were the subject of much controversy, advances and retreats. We should bear in mind that policy and legislation were also constrained by structural social and cultural processes associated with modernity: the transformation and individualisation of many spheres of work and labour; social and geographical mobility and urbanisation; the rise of education, literacy, the arts and media. All these had inputs into objective conditions and subjectivities which exerted various degrees of pressure towards liberalisation. Capitalism and consumption added to pressures for liberation in new ‘economies of desire’. Equally, they raised anxieties in conservative and patriarchal quarters about loss of control over women and the young. It is interesting to note that Saudi Arabia is the one country that was most successful in resisting these pressures for longest: not only was it the most socially and culturally backward, but its bonanza of oil revenues and their distribution exempted its rulers from the pressures for change in other parts of the region. ‘Islamic’ Iran enjoyed no such luxury. Demotix/Luke Somers. 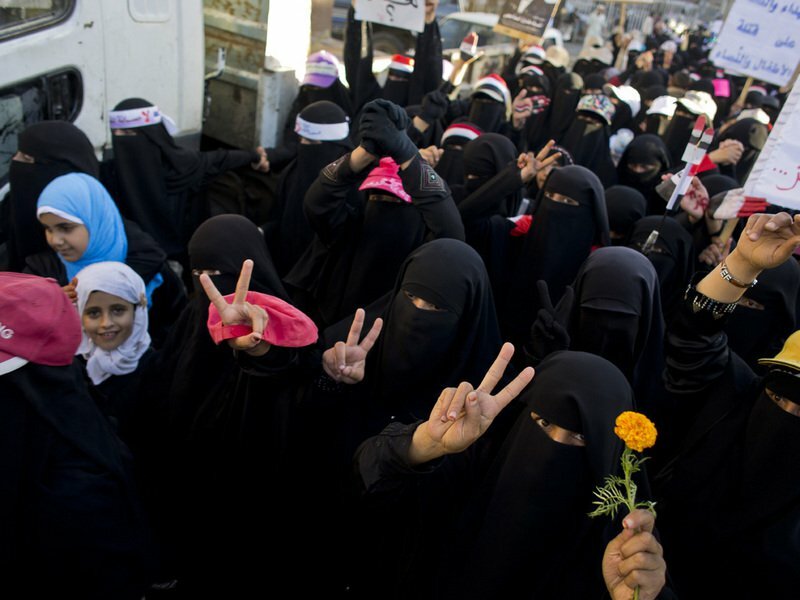 Yemeni women in support of pro-democracy protesters in Ta'iz. All rights reserved. Some elements of the historical Shari`a provisions on family law remained in the reformed systems of all Middle Eastern countries bar Turkey. Ataturk abolished all Shari`a provisions and made the advocacy of the Shari`a an offence. At the other extreme, Saudi Arabia maintained the full force of the historical Shari`a in family and gender provisions. Most other countries instituted legal reforms which retained some elements of Shari`a provisions. Issues affected included restrictions on rights of a man to multiple marriages and unilateral divorce at will, as well as giving the wife some rights regarding divorce and custody of children. The liberty of the wife to work outside the home and to travel abroad without the husband’s or male guardian’s permission has remained a thorny issue in many countries. Legal reforms, from the Ottoman Tanzimat of the mid-nineteenth century, involved the codification and etatisation of law, on European civil law models, with modern court systems and procedures, except for family law which continued to be entrusted to Shari`a courts, with religiously trained personnel, but subject to reformed state legislation which varied over time. It was in the 1950s that many of the ‘mainstream’ countries, such as Egypt, Syria, Iraq and Morocco, abolished the separate Shari`a courts, and integrated family law into the regular civil courts, but ruling in accordance with reformed, codified, Shari`a provisions. This step was enacted by military dictators, against the stifled displeasure of religious and conservative circles. This was most notable in Iraq, under Qasim, who came to power at the head of a military coup in 1958, and enacted some of the most liberal family provisions in 1959. These reforms, which abolished Shari`a courts, and gave women enhanced rights in marriage, divorce and inheritance, delighted the strong leftist-secularist current of the time, and angered religious conservatives. A mocking rhyme chanted in the streets was: tali al-shahar maku mahar, wul-qadi nthebba bil-nahar, ‘come the end of the month there will no longer be dowries, and we shall chuck the qadi in the river’. The bloody CIA assisted Ba`thist coup in 1963 put an end to the relatively benevolent Qasim dictatorship, and brought in the rule of a pan-Arabist and sectarian Sunni regime under the backward Arif brothers. Sure enough, a delegation of venerable clerics, Sunni and Shi`i, prevailed on Arif to reverse all Qasim’s reforms. The second Ba`th coup in 1968 ultimately brought Saddam Hussein to dominance in the 1970s, the ‘golden age’ of prosperity and cultural revival funded by multiplication of oil revenues, which also reinforced the security state and bloody repression. This regime pursued secularism quite seriously, aimed, in part, at weakening religious and patriarchal loyalties in favour of the regime and party. The 1970s and 80s saw great strides in the empowerment of women in family and society and the curbing of religious authority over family law, albeit within the limits of the totalitarian security regime which integrated all women’s organisations within the Ba`th Party and the state. Tunisia is generally reckoned to be the most liberal of Arab states on family law and women’s rights. It is, for instance, the only Arab country to ban polygamy outright, while most of the others could only introduce restrictions of the man’s right to multiple wives. These measures were part of the modernising project of another dictator, Bourguiba. We should add, however, that Tunisia was the Arab country with the most vibrant civil society and associational life, which chimed in with Bourguiba’s reforms. The Nahdha Islamists, brought to power by elections have promised not to reverse these reforms, but will they resist the voices from below clamouring for a more vigorous Islamic project? Demotix/Sabrina Belkhouja. 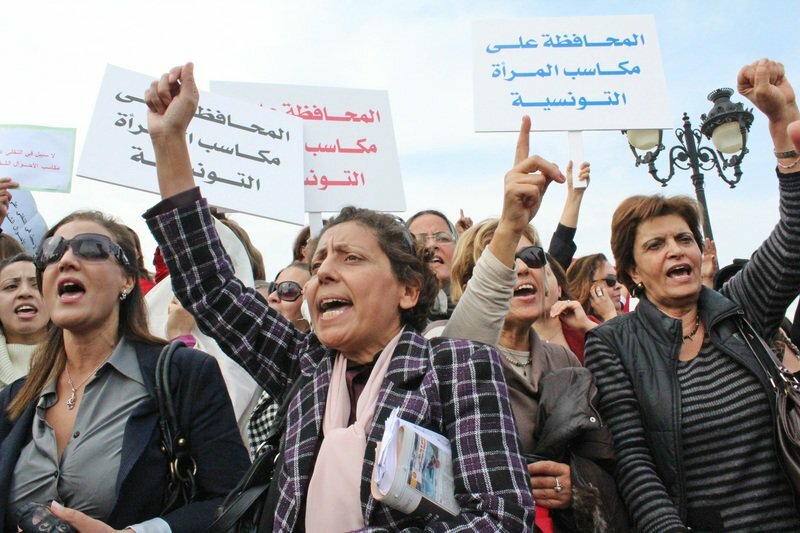 Women in Tunisia claim their rights and defend their status under the constitution. All rights reserved. In Egypt the most significant reforms of the twentieth century were promulgated by Anwar Sadat in 1979, known as the ‘Jihan law’, after Sadat’s wife who was believed to be the instigator. This law was promulgated by presidential decree, under emergency powers, bypassing parliament which was not sitting at the time. This was to prove its later undoing in 1985. These laws gave further rights to women within the family, imposing conditions on polygamy, requiring divorces to be subject to judicial procedures, giving more rights to wives in divorce and custody, enabling married women to work and travel, and giving them a right in the matrimonial home. Sadat cobbled together a committee of ulama who rubber stamped the reforms, but some of whom reneged later, after Sadat’s death. These reforms were at odds with Sadat’s general tenour of appeasing Islamists, and his amendments to the constitution to declare the principles of the Shari`a as the source for all legislation. These contradictions gave rise to much controversy and litigation after Sadat’s assassination (by jihadists) in 1981. Islamist lawyers petitioned the Supreme Constitutional court, which ruled in 1985 that the law was unconstitutional, not because it did not conform to the Shari`a, as the litigants demanded, but because it was passed by presidential decree. Many of those provisions, however, were re-enacted by parliament soon after, amid much controversy and resistance by Islamists. In 2000, further controversy surrounded another decree giving wives the option of initiating divorce if they renounce any financial or property rights. This was based on an obscure and controversial provision in the Islamic canon called khul`. It remains to be seen now what the new parliament and constitution, dominated by the Muslim Brotherhood with Salafi outflanking, have in store for family law. Many of the persons and forces that opposed the reforms in the past are now in that parliament, but with the more respectable elements trying to be conciliatory and liberal. What of the ‘Muslim feminists’ who have been so prominent on the ideological landscape, primarily in the west? Have their revisionist reading of the religious canon and empowering advocacy achieved any policy or legislative results? Not tangibly, with one possible exception. Arguably, and paradoxically, their greatest success, however modest, was Islamic Iran during its ‘liberal’ interregnum between Khomeini’s death in 1989 and Ahmadinejad’s incumbency in 2005. 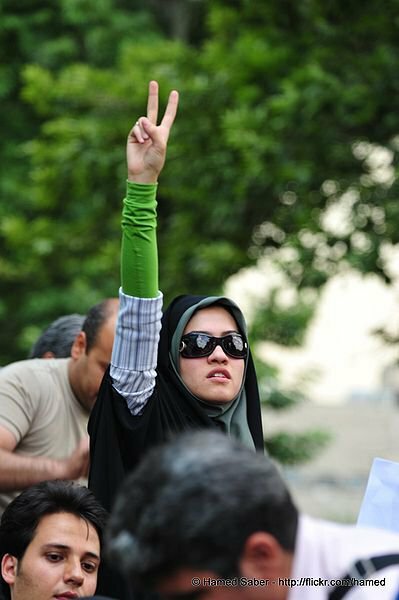 During these years many liberalising policy and legislative measures were achieved under pressure from elements, including women, from within the fragmented Islamic establishment, as well as from the relatively free opposition sources. These appear to have come to an end under the increasingly repressive and arbitrary rule of the closely allied executive and judiciary. Iran’s judiciary appear to be truly independent: from the law! 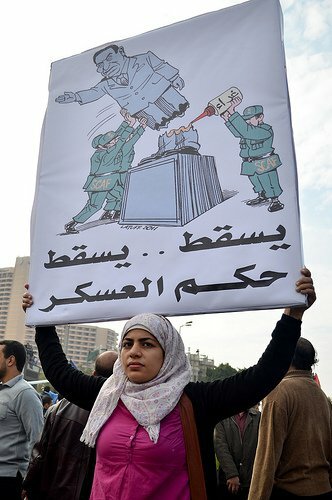 Women are often at the forefront of the recent dramatic and exhilarating uprisings in the Arab world. They are a vital component of the generation of ‘citizens’ who proclaimed the universal values of liberty and justice. Where they succeeded in ushering democratic reforms, however, the elections seem to have brought to power elements that are, to say the least, ambivalent about these values. Dictators, survivors and aspiring, would now judge it wise to appease backward sentiments rather than engage in the modernising thrusts of their twentieth century predecessors.